But something is still wrong in the image above... If you look carefully, you can see that the browser zoom is set at 50% - yet somehow the image is sized correctly despite us not doing any work to handle the browser's zoom setting yet. How can that be? Hold on, Sherlock, there's another clue in the image: look at the size of the buttons. Yeah, those buttons are not the size they should be for the 50% zoom setting that's active (refer back to the previous image if you don't believe me). Those buttons are at the 100% size - wha?? It turns out that when you attach an event handler to the Resized event, Silverlight 3 disables its support for browser zoom. The reason being that Silverlight 3 assumes the application has chosen to handle that event because it wants full control over the zoom experience (via ZoomFactor and Zoomed, perhaps). Now that's really kind of thoughtful of it and everything - but in this case it's not what we want. In fact, that behavior introduces a somewhat jarring experience because the graphics visibly snap between 50% and 100% as the Resized event handler is attached and detached. Well, that was then and this is now: I'm pleased to report that Silverlight 4 does not have the troublesome "hooking Resized disables browser zoom" behavior! Consequently, projects targeting Silverlight 4 are free to hook the Resized event without worrying that their browser zoom behavior will be compromised. Yay! Aside: Of course, projects targeting Silverlight 3 (or previously compiled for it) and running on Silverlight 4 will continue to see the same Silverlight 3 behavior. This is because Silverlight 4 maintains backward compatibility with previous versions to avoid "breaking the web" when a new version comes out. Specifically, applications written for version N of Silverlight are expected to run the same on version N+M - even when there have been changes to the relevant functionality after version N was released. One of my ContextMenu test cases for the April '10 release of the Silverlight Toolkit (click here for the full write-up) was to implement a quick "split button" control for Silverlight using Button and ContextMenu. In that post, I cautioned that my goal at the time was to do some scenario testing, not to build the best SplitButton control ever. However, what I came up with seemed to work pretty well in practice and I figured folks could probably use the code mostly as-is. The position of the ContextMenu was wrong when the browser is zoomed: True enough - though I'm going to ask for a bit of leniency here because the cause of the misalignment is actually a bug in Silverlight (which I've already reported). It seems the results of a call to element.TransformToVisual(Application.Current.RootVisual) or element.TransformToVisual(null) are not consistent for elements that are vs. are not inside a Popup control when the browser is zoomed (in or out). As a result, the SplitButton code to position the menu got inconsistent data and was unable to place the menu correctly. I've tweaked the code slightly to accommodate the underlying issue and now the menu is properly aligned at any zoom setting. In fact, I've added a new, WPF-specific assembly (SplitButtonWpf) and demo (SplitButtonWpfSample) to the sample code associated with this post. Which means there is a dedicated assembly containing SplitButton and MenuButton for both platforms as well as a separate sample application for each! With those changes in place (and an unrelated key handling tweak for WPF), I feel even better about the prospects of using SplitButton and MenuButton in a real application. Naturally, if something else comes up, please let me know. Otherwise, I hope you find it useful! CSI is a simple C# interpreter and has been available for .NET 1.1, 2.0, 3.0, and 3.5 for a while now. Earlier this year, I updated CSI for .NET 4 Beta 2, and now I've (somewhat belatedly) updated it for the final, public .NET 4 Framework. Today's post is mainly about getting an official .NET 4 RTM-compiled build of CSI released, so there aren't any functional changes to the tool itself. FYI: I have a TODO list and there are some interesting things on it - it's just that none of them seemed particularly urgent. The links above explain what CSI is and how it works; the executive summary is that CSI offers an alternative to typical CMD-based batch files by enabling the use of the full .NET framework and stand-alone C# source code files for automating simple, repetitive tasks. It accomplishes that by compiling source code "on the fly" and executing the resulting assembly behind the scenes. The benefit is that it's easy to represent tasks with a simple, self-documenting code file that leaves no need to worry about compiling a binary, trying to keep it in sync with changes to the code, or tracking project files and remembering how to build everything. The copy of CSI.exe in the root of the download ZIP is now the .NET 4 version because that's the latest public .NET Framework. Previous versions of CSI can be found in the Previous Versions folder: CSI11.exe, CSI20.exe, CSI30.exe, and CSI35.exe. there is no need to maintain a separate EXE file. CSI (CodeFile)+ (-d DEFINE)* (-r Reference)* (-R)? (-q)? (-c)? (-a Arguments)? whatever value the executed program returned) if it executed successfully. accommodate environments where the latest version of .NET is not available. A customer contacted me a few days ago asking how to display text labels on a NumericAxis. (Whereas CategoryAxis makes it easy to use text labels for the independent axis, this request was about text labels on the dependent axis.) It's a bit of an unusual request (I spent a minute just now and don't see how to accomplish this in Excel), but I knew it would be easy to do with the Charting controls in the Data Visualization assembly that's part of the Silverlight Toolkit and WPF Toolkit. I've added the sample shown here to my DataVisualizationDemos application which is collection of all the Data Visualization samples I've blogged. 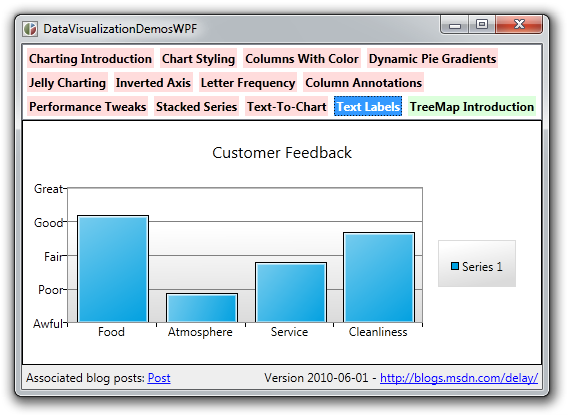 Like the core Data Visualization code itself, the demo app compiles for and runs on multiple platforms with the same code and XAML - it's an easy way to publish a sample and show it running on Silverlight 3, Silverlight 4, WPF 3.5, and WPF 4. Just for kicks, I've used the "Compatible" ColumnSeries for this example - but it works just as well with traditional ColumnSeries. Better yet, the basic idea can be generalized to solve a variety of similar problems as well! /// Implements IValueConverter to convert from double rating values to friendly string names.